Monitor Point is a reporting and analytics application for the Capital Markets. The application currently has modules for Risk, Compliance & Accounting. – Risk dashboard – a live monitor with trade feed and reports displaying real-time exposure and concentration by counterparties. The Breach Management screen lists concentration limit breaches and the underlying trades of a particular breach. As soon as a breach happens, the breach workflow is triggered. The workflow can be configured to the processes of each Firm. A task is created and assigned to a configured user. User can reassign the breach task to another user group. All user activity is logged. 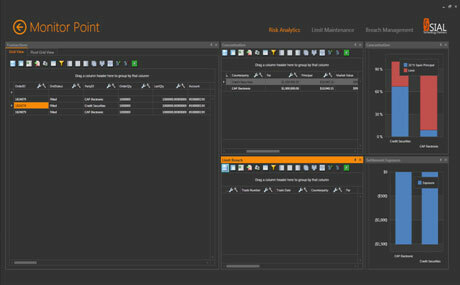 Monitor Point-Recon was built out of a need for creating a tool that is robust, flexible, and with a scalable architecture which enables customization, streamlined data capture and validation, advanced exception management and robust reporting. Originally designed for the needs of asset management within the hedge fund industry, the software has the flexibility to accommodate an ever increasing list of sources, multi-asset class portfolios to automate trade, position/holdings, cash and P&L reconciliations across both listed and OTC products. Such capability is increasingly important for firms from and investor, competitive and regulatory perspective. Reconciliation activity requires financial services firms to overcome the challenge of managing across an expanding set of asset classes, currencies, business entities. As regulatory demand increases, so does the need of a scalable, robust and cost-efficient solution. -Flexible Pricing and acquisition models.